Saguaro East is a 9.5 mile loop of up and down thrills! ROAD BIKING, TUCSON, Arizona – Saguaro National Park, also known as the “Loop Ride” is one of our classic road bike rides enjoyed by serious armatures to the novice. 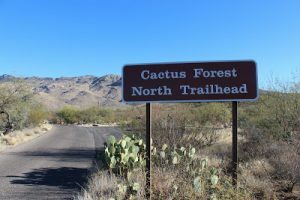 The park is the most scenic and thrilling short ride in all of Tucson that winds through a cactus forest to the base of the Rincon Mountains. This is a 9.5 mile loop ride that will get your heart pumping. The rich vegetation is home to all kinds of desert critters from deer to javelina, lizards and snakes. Ride with caution and enjoy this. Many cyclists start here, do a few laps then head down south to Colossal Cave. The ride to Colossal Cave is a really fun, safe ride with a spacious shoulder. NOTE: The Saguaro National Park is a national park and does require a small fee for entry. If you are from out of town and too cheap to pay, wait for a local with an annual pass and ride in with them to avoid the $5 fee. The locals with annual passes can get two cyclists in per pass.